About 13.3 million people tuned in for the finale of "American Idol," a retirement party that showcased the singers who owe their success to the Fox reality show. While the night didn't go exactly according to plan — members of the studio audience noticed a snafu at the very end — the broadcast was a fitting send-off for a show that, as President Obama said in a pre-taped tribute, "transformed television." Well-connected fans mingled with Hollywood agents and former contestants at the Dolby Theatre, and everyone — right on up to Fox executive chairman Rupert Murdoch — knew the night was historic. "I can't believe this is the end!" "I thought this would never happen." The audience hype man, in charge of keeping the crowd energized during commercial breaks, had no trouble doing his job. He paused several times to acknowledge the hundreds of producers, engineers and technicians behind the scenes. 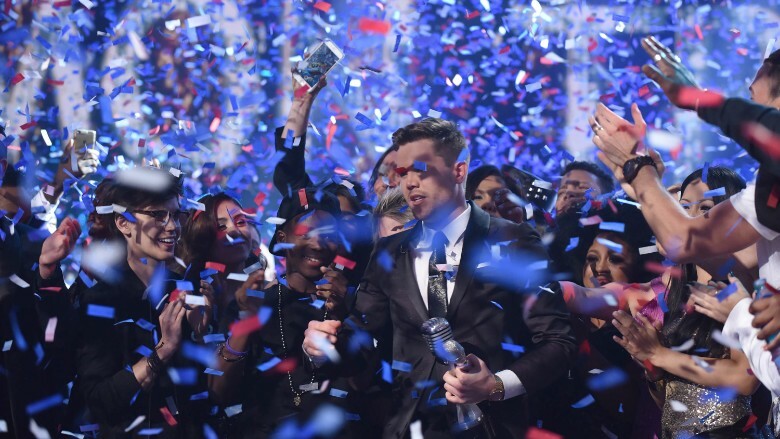 Trent Harmon wins the "American Idol" finale. "A round of applause to everyone involved in the making of American Idol for the past 15 years," he said at one point. "It's been an amazing run." 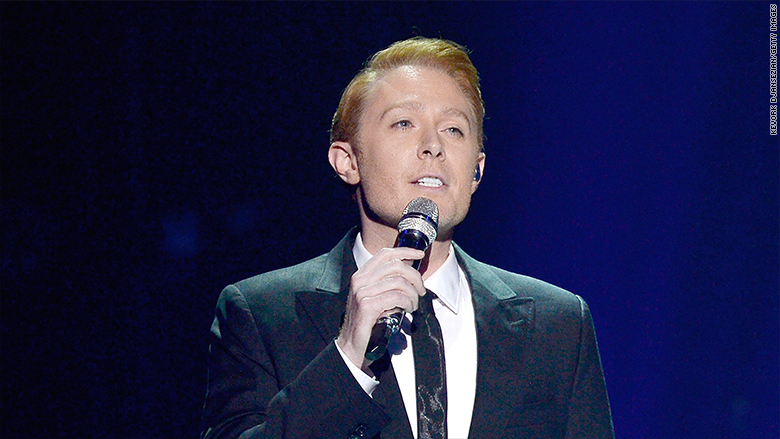 Backstage, the night had the feel of a high school reunion, season two runner-up Clay Aiken said. "Did many cry? No. But for most of us it is like seeing our high school closed," Aiken told CNNMoney. "It was an important part of making us who we are, but many of us haven't gone back to it in years. But it is a part of us." Aiken, like dozens of other past contestants, sang on stage during the finale broadcast. Season four winner Carrie Underwood, generally thought to be the biggest "Idol" star in attendance, performed the final song before Ryan Seacrest announced the results of this season's competition. When an audience member bellowed "We love you Carrie" from the balcony, she turned back and waved. But she had to exit quickly, as the stage was a frenzy of activity during every commercial break, with up to 20 staffers sweeping and mopping and setting up performance spaces. A few steps away at the judges table, there were hugs and selfies. During the final commercial break, executive producer Nigel Lythgoe reached for a mic and told the studio audience what would happen next. After the winner — Trent Harmon, it turned out — "sings their coronation song, we are all going to sing 'A Moment Like This,'" he said. He asked the theatre crowd of 3,500 people to stand up, hold hands and sing along. "Share with us this incredible moment, of where we started right here, and where we end it, right here," he said. Season one winner Kelly Clarkson originally performed "A Moment Like This" on the very same stage in the summer of 2002. It was a fitting way to bring the show full circle. But it didn't quite work. "Fifteen back. Here we go," a voice said over the speaker system. Seacrest asked lighting director Kieran Healy to "dim the lights" one final time, and then presented Harmon as the winner. The confetti cannons were almost overpowering. If there was any singing of "A Moment Like This," it was barely heard over the cheering and dancing on stage. The final words came from Seacrest, who thanked the viewers at home. "One more time" — he swallowed and said "this is so tough," then paused — "We say to you, from Hollywood, good night, America." There was another long pause, and then Seacrest said something that wasn't audible to the studio audience, but was heard at home: "For now." As in, "goodnight, for now. We'll be back." 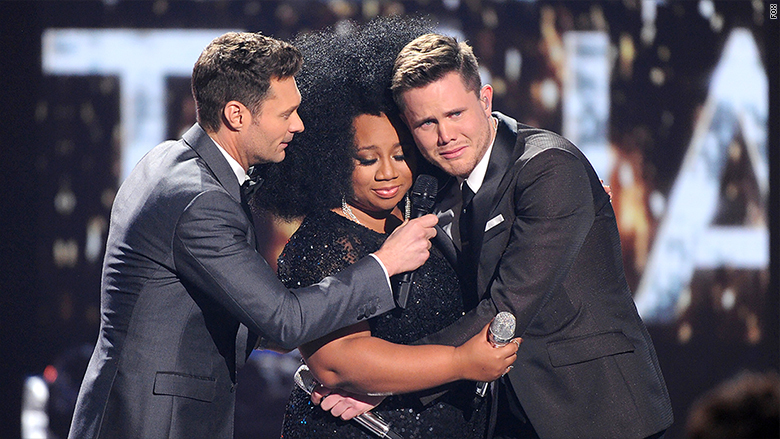 When the ratings came in on Friday morning, Fox said it was "Idol's most watched finale in three years and its most watched telecast in over two years." The consensus among the Hollywood types at the after-party was that, yes, "Idol" will be back, someday, but in a different form. 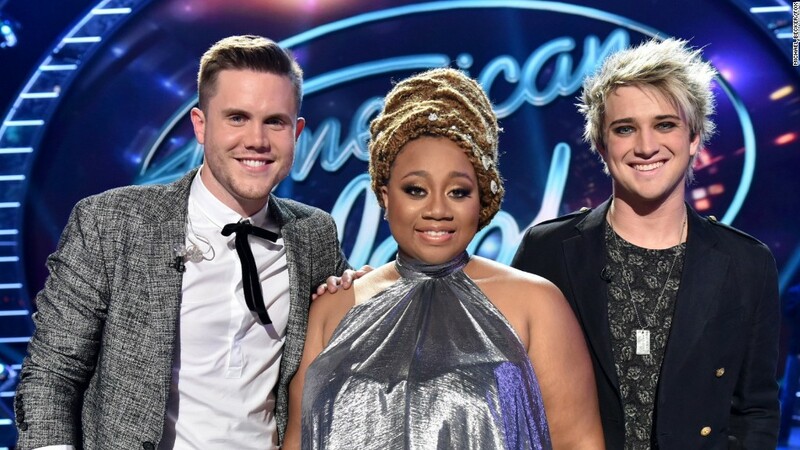 Aiken said he thought "the finale that Nigel created was a perfect tribute to the power 'Idol' has had, not only in creating huge powerhouses like Kelly and Carrie, but in giving the kid next door a chance to have their dreams come true and giving Americans at home a chance to be a part of that. No show will ever do that as well." Editor's note: Nielsen has adjusted the audience size to 13.3 million.